The leaves are FINALLY starting to change! Can’t we get a HALLELUJAH?! I have known Kaitlin since high school, so when she asked us to be hers and Adam’s wedding photographers, we jumped at the chance! They decided on having a Great Falls engagement session because this time of year is very special to them and who can resist those falls?? 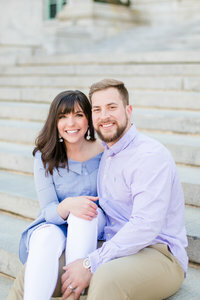 Adam and Kaitlin met at our local college in 2009! They both took a computer class together. Kaitlin noticed during class one day that Adam was playing a computer game next to her that she had never played before, so she told him she wanted to learn how to play! He told her he would save his game to show her how to play during the next class, and he did! Not too long after that, they decided to start going steady and it was the best decision they ever made!! Then came the first date! Adam took Kaitlin on a first date to dinner and a movie. They went to Ted’s Montana Grill in Alexandria, then saw Paranormal Activity at AMC Hoffman theater. They both LOVE Horror films, so it was perfect! Another obvious reason why they had to have a fall engagement session! After spending a few years together, Adam decided that it was the right time to ask Kaitlin to marry him! He proposed to her on October 15, 2016, at Belvedere Farm in Fredericksburg! Again, the fall!! This reminded me of Tony and I so much because although our season wasn’t Fall, all of our first dates, engagement, and wedding happened in the winter! Adam strung the ring on twine and tied it around a pumpkin stem. He called Kaitlin over and asked her what she thought of “that” pumpkin, then he got down on one knee!! Right there in the pumpkin patch!! It was so perfect that both of their families were there to witness such a special event in their lives! They had celebrated their seventh year dating anniversary a couple days prior, so it made it that much more special. Take a peek at a few of our favorites from this gorgeous engagement session! To browse other fall engagement sessions, click through the links below!